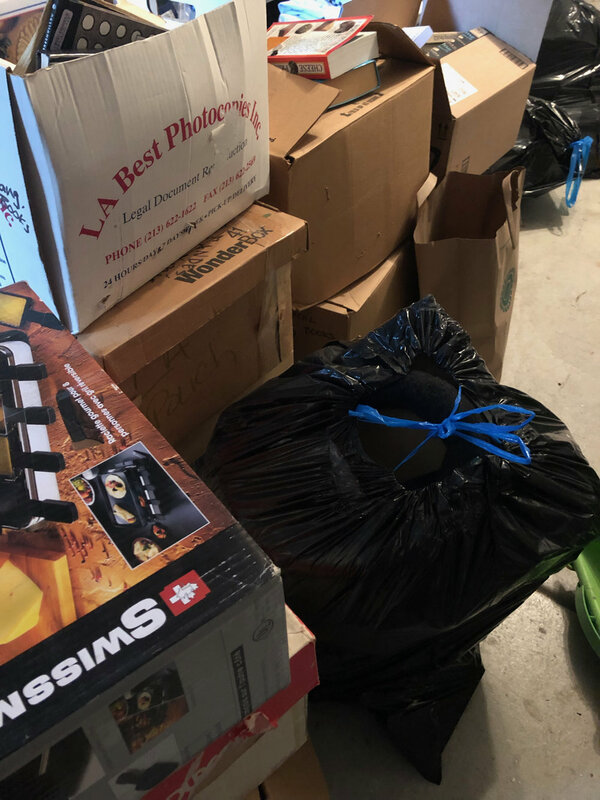 I’m grateful for a lot of things, including having a house to clear out, a family with whom to clear it, and the ability to carve out the time necessary to complete the task. Do you know what is amazing, though? Living in your house when you are done clearing. 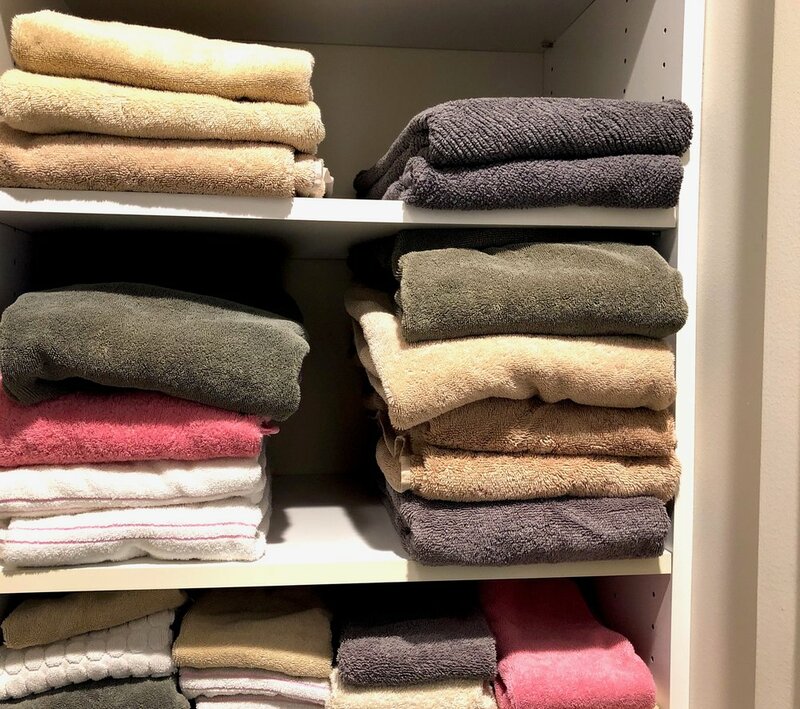 Every time you open a drawer, the linen closet, or a bin in any space (because we now have bins! and some are labeled! ), it’s a moment of “WOW! I see where everything is and this space looks neat and so inviting. What amazing person lives here? OH RIGHT, IT’S ME.” And if something is out of place, it’s totally obvious and you can use Gretchen Rubin’s “1 minute rule” and fix it. (See her other great rules in that list, too.) When things are organized, you know what you have, where it is, and if it’s out of place, where it lives. All this sounds so obvious, and it is, but it’s still a profoundly great lived experience. And, once everyone knows where things live and is on Team Tidy, there’s a lot less of “I CAN’T FIND MY . . .” or “WHERE IS MY . . .” and you feel just a little bit more free. We cleared out a horrifyingly impressive 1,340 pounds of weighed stuff. That figure doesn’t count the large donations of clothing and other things I made separately and didn’t weigh. I tried to find an eye-popping animal equivalent to our pounds of stuff, but “One Female Giraffe (1,600 lbs)” doesn’t sound that impressive to me. Maybe it’s simply enough that we spring clean every year, and still, we got rid of more than a half a ton of stuff. I mean, I was at Recology so often that the cashier told me I was a good customer and started showing me photos of his family. One day, half joking, I asked him, “How’s business?” He laughed and replied, “Business is always great. Everything we own will eventually become garbage!” I am still letting that reality sink in. Old habits are so hard to break. But I’ve got three wish-intentions I’d like to make real: May we make responsible buying decisions (and push companies to give us better, less plasticky packaging options), may we store less, and please, please may we maintain our space so we don’t have to do this again next year. I love spending time with friends who don't have kids. It makes me feel outrageously happy and ridiculously special. We made our schedules work! We are guaranteed to talk about Interesting Non-Kid Things for the majority of our time together! I revel in the joy of a friendship we chose, as opposed to one that's simply convenient. And let's be honest--thank goodness for friendships of convenience! Friends at work, neighbor friends, and school friends are how we get through the day. Family friends with kids around the same age as your own? Pure magic. But here's the thing. Those of us with a child (or more) can get lured into thinking that we should only be friends with other people with children. We can even get lulled into the idea we should find families like our own, with children of similar ages and abilities, and just hang around with them. Don't be fooled! A strong sense of humor, kindness, and an adventurous spirit matter way more than age, ability, or whether someone has a child. Everyone was a kid once, and the fact that someone doesn't have kids does not mean they dislike them, or that they even vaguely dislike you for having one (or more). Your friends without kids might even welcome the chance to revisit some of the fun parts of childhood. The "fun parts of childhood" vary from person to person. What you did as a kid may be different from what your friends did. And these differences are so good. They mean that you don't have to know or learn everything as a parent! You just need friends. If you're lucky, you've got friends like Susan and Wayne. They don't have kids, and they are so funny, incredibly kind and up for just about anything at least once. Even better? 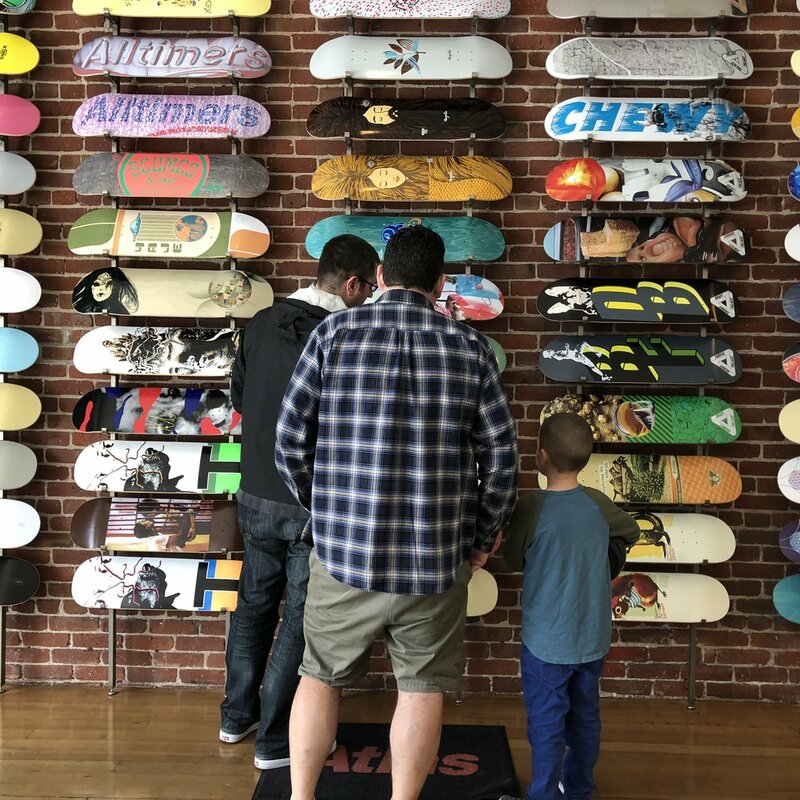 They know so many things we don't, including everything important about skateboarding (they'd downplay their expertise, but that's another reason we like them). 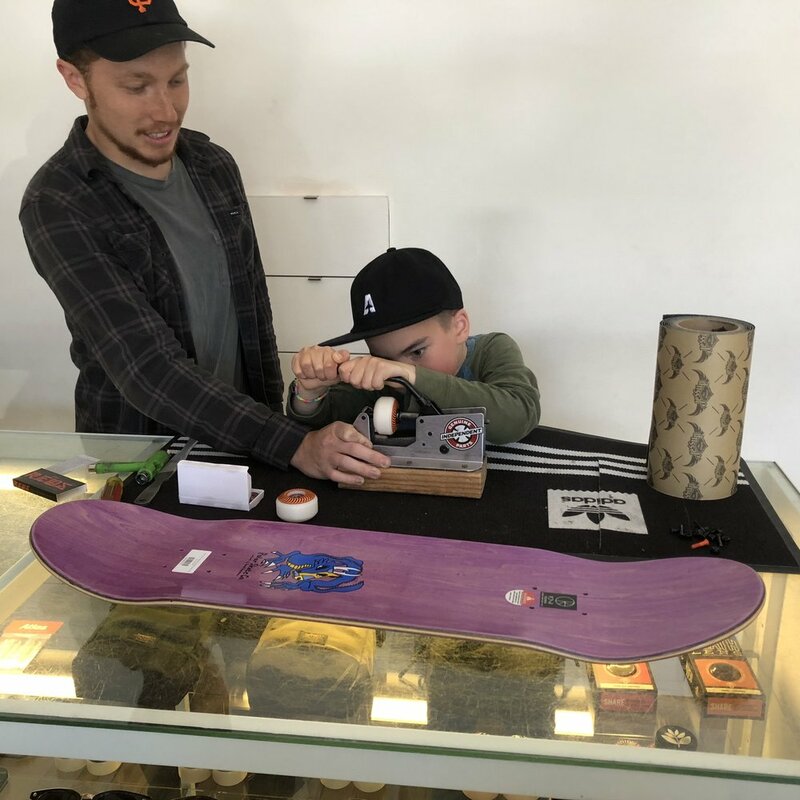 Marc and I just had to mention to them that Wyatt was interested in taking up skateboarding. Suddenly, it didn't matter that we knew nothing about it. 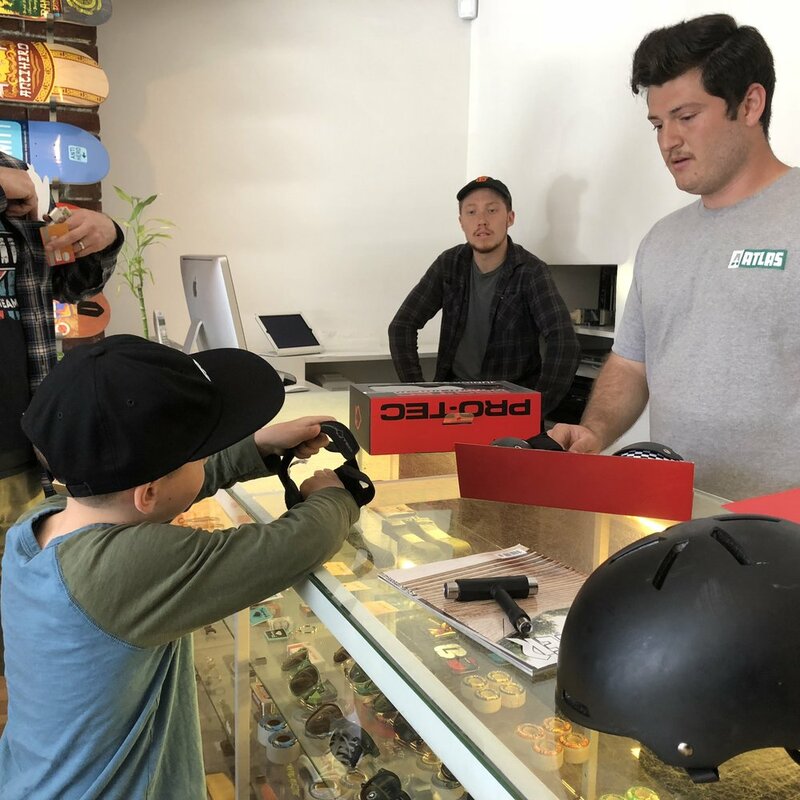 They introduced us to their friend and his skate shop, and they took Wyatt shopping for his first board. They even bought it for him. And then? Wayne got him started with the basics in the skate park. 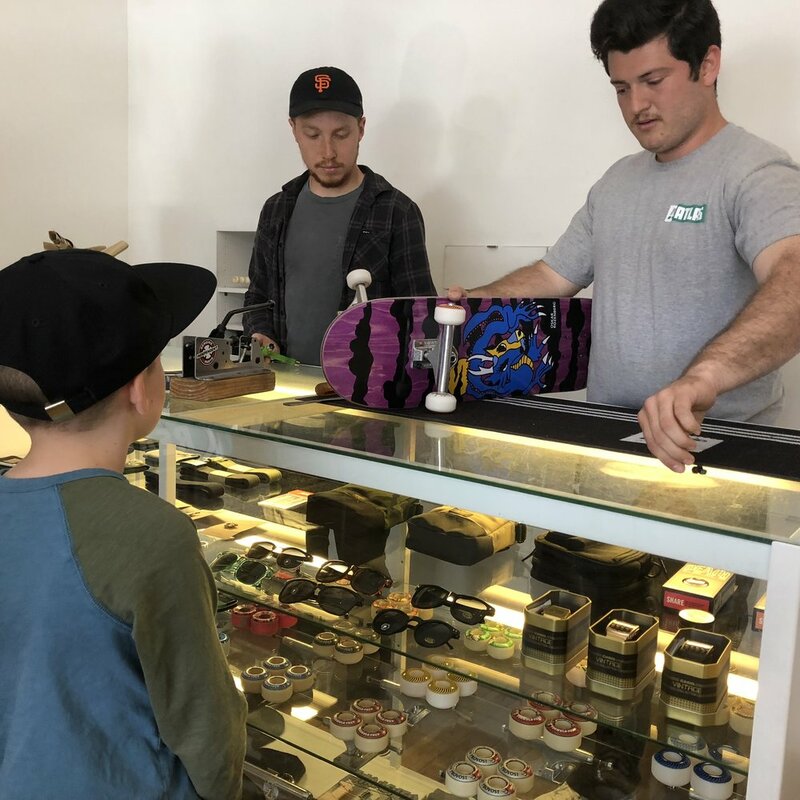 More skate meet-ups have followed. One of those days also involved a post-skate LEGO building session. There's every reason to share this kind of fun with friends, regardless of whether those friends have kids. Or maybe even especially if those friends don't have kids. I know three people who love eating breakfast for dinner: Wyatt, our friend Margaret, and me. And when I say love, I mean we LOVE IT. We anticipate it, plan it, cook it, and eat it with a level of gusto that many people reserve for Christmas or Thanksgiving. BFD didn't start out as BFD. It started as Margaret coming over to have drinks and do crafts with me after Wyatt was in bed. It was terrific. I got friend time while we worked on fun projects, taught each other new skills, and talked about big things. Also, her being game for a pretty scruffy and low-rent version of a night out freed me from the stress of worrying I'd be late meeting her somewhere or would have to cancel at the last minute because Marc was delayed. Soon, though Wyatt understandably began complaining that he wasn't getting any Margaret time on those craft evenings, so we invited her to come over for dinner, too. I cooked and served actual dinner food. That combination of dinner-crafts-and-drinks was even better. But, the evolution was complete when we realized our shared love of BFD. If you ask me, when you add art or craft to BFD, an evening reaches new heights. I think BFD with Margaret may be a tradition already. We always make waffles,* bacon, and some form of eggs (scrambled, frittata, or mini-frittata-in-muffin-tins-with-chive-flowers-on-top). We also have salad--fruit or vegetable. One salad was roasted beets with greens, goat cheese, and a citrus dressing. Another was cut fruit. It's quite the celebratory spread. Usually, Wyatt and I cook some of the things, and Margaret brings some of the things and finishes cooking or assembling them at our house. Last week, Margaret had a free afternoon, so she came over early. She gave us a drawing lesson. And then we cooked together. I learned how to cook bacon in the oven, and Margaret got to see me make the waffles in real time. Wyatt thought the flowers growing on the chives would be a lovely garnish to the mini-frittatas, so he was Chief Frittata Decorator. Then, we ate together. We all agreed BFD was even more incredible than usual. Marc concurred later (but his love of BFD is less overwhelming than Margaret's, Wyatt's and mine). After Wyatt was in bed, Margaret and I had more time to catch-up, uncensored. Going out is fun, and being fancy can be SO FUN. But "out" and "fancy" are hard for me to muster these days. Lately, I'm so grateful for a friend like Margaret who meets me--literally and figuratively--where I am. *For waffles, I make a double recipe of Pamela's waffles. I substitute half of the baking mix with It's Wholesome Hi-Protein Pancake mix, add more water until the batter is the right consistency, and strategically drop in blueberries just before closing the waffle iron. "No. I don't want a birthday party. I want to celebrate at school with my friends, but only at school. Let's do something else for my birthday." This declaration came a couple of months ago. No party? No problem. And honestly, why would we even question such a declaration? Instead, we counted our blessings and then started brainstorming birthday adventures. 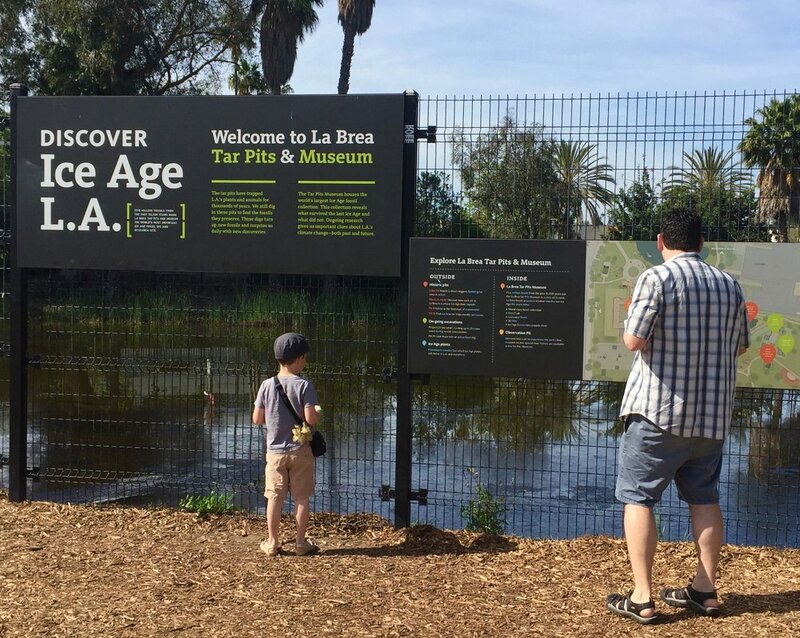 There were plenty of ho-hum local options, as well as a more far-flung option: Southern California and the La Brea Tar Pits. I asked some truly dear friends in Southern California if we could come for a visit. It's important to know that for Wyatt, there could be no better present than getting to stay with these friends. Ever since our first stay with them about a year and a half ago, Wyatt began announcing regularly that he wished he could stay with them for the rest of his life. Ever the gracious hosts, they were quick to get on board with our proposed plan, and they even provided us with our trip's theme song: Felix Figueroa's Pico and Sepulveda. 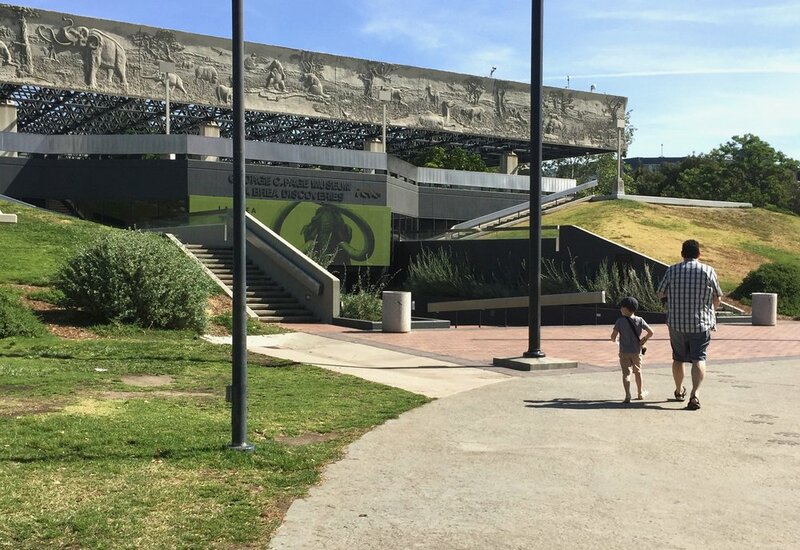 We sang it for weeks, wondering if, unlike in the song, our dreams might actually come true at the Tar Pits (Tar Pits!). I am happy to report that our (fossil-related) dreams did come true. It was jaw-dropping to learn about the truly massive creatures that roamed the area we now know as Los Angeles a mere 11,000 years ago. Remains of sloths that could weigh up to seven tons, mastodons, wooly mammoths, saber-tooth tigers, enormous birds, and dire wolves have all been found in those pits. And archaeologists are still finding more and more remains, all preserved by that goopy, stinky tar. Unlike the creatures, we steered clear of the tar. Good thing, because that meant Wyatt's other birthday dreams could also come true. 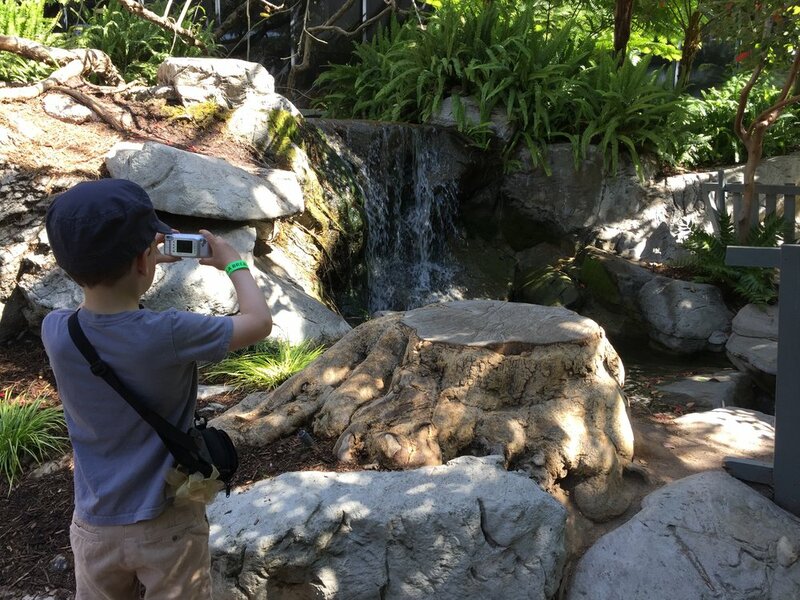 In addition to going to the Tar Pits, he got to attend his cousin's birthday party at the beach, eat cupcakes and have a fancy seafood dinner out. On his actual birthday, he got to visit with a dozen friends, open presents, swim, eat cookies, cake, go out for ice cream where they had gluten-free cones(! 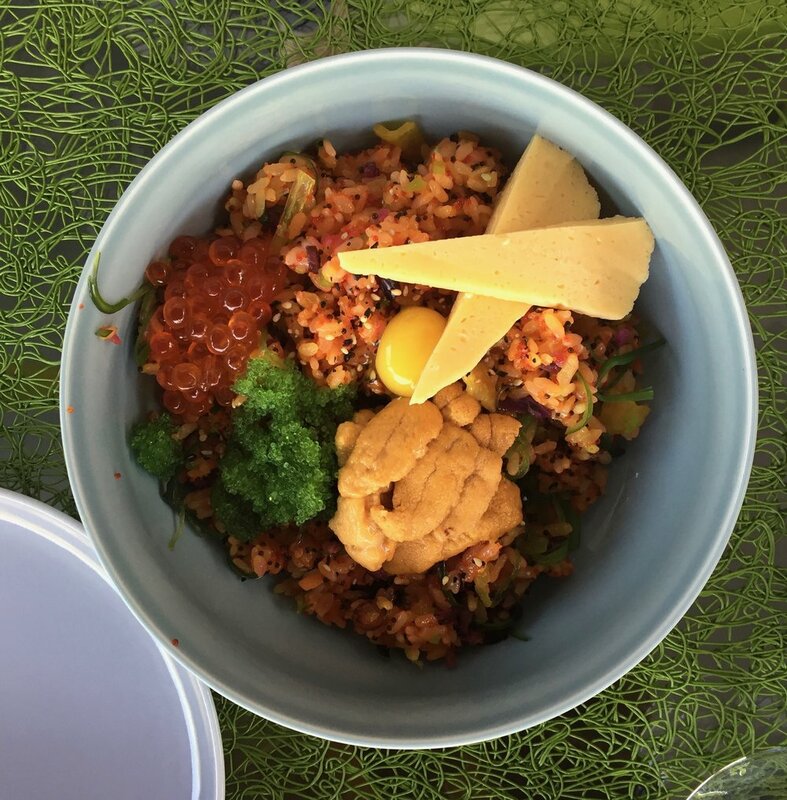 ), meet a seeing-eye dog, and then have his dream dinner, Al Bap (a fish roe rice bowl), as prepared by our hosts (who, in addition to their many other enviable traits, are also amazing cooks). I have no recipe to share; photos must suffice. We had such a good weekend, it was really hard to leave. It was so hard, in fact, that Wyatt, in a fit of sadness and frustration, declared while we waited for our (delayed) flight at LAX that he wasn't ever going to eat anything ever again. I think he thought that vow would perturb Marc and me (it didn't). In case you're curious, he lasted about 2 hours. I fully empathize with Wyatt's reluctance to leave, short-lived hunger strike and all. It has been more than ten years since I lived in Southern California, and while I have become very fond of San Francisco, I [still] Love L.A. Thanks to our friends, I felt as if I had come home for a weekend, and that feeling is one that's really hard to let go. This was us seven years ago at City Hall, on the fifth anniversary of our first date. It was the day we got married! It was such a good day, as you can see on our faces. The last seven years have brought a lot of change, most of it thanks to becoming a family of three. Our current life bears no reasonable resemblance to our carefree existence of seven to twelve years ago. I mean, there was actually a time when we were decent resources for on-a-whim travel, amazing restaurants, and movie recommendations because we traveled lots of places (sometimes on a whim! ), ate at terrific new restaurants regularly, and saw lots of movies whenever we pleased. Now? You'd need a macro lens to see what we've been up to, other than bringing up a child. If I let you zoom-in, you'd notice, in addition to some new fine lines, lots of challenging, internal work we've done separately and together. You'd also see how we've shared some amazing, terrible, and solidly in-between times along the way. You'd be impressed at what we've learned, shocked at what we haven't, and unable to stop laughing at how we continue to step in it. I'm grateful every single day to have a partner who loves me to distraction. And being in a relationship that demands, in the best ways possible, that we each support the other person's growth? You can't beat it. The traditional gift for the seventh year of marriage is wool. And if I had bothered to learn that fact sooner than the night before our anniversary, I could have done something really terrific with that knowledge. Instead, I kicked myself and proceeded to look at dessert recipes. I made chocolate pie, and we happily shared it with friends who unexpectedly dropped by around dinner time. I used this recipe, along with the gluten-free frozen pie crust from Whole Foods. And if you don't have pie crust? It's great just as pudding. Breakfast pudding even. Don't ask how I know. Photogenic Inflatable Flamingos at SCRAP. "Dude" is such a versatile word. Sure, it's really casual and not particularly respectful, but I love it. It is one of the few words in the English language where you can apply many different intonations and get an equal number of different meanings. "Dude" even works beautifully without voice intonation, like in texts, as my friend Sarah proved this week. She texted me, "Dude," followed by a photo of her poor son, Benjamin, who was sitting as close as possible to the toilet, resting his head on the seat. "Dude" says it all, including the sarcastic, "Thanks, barfing flu," the frantic, "I know I should really seriously avoid using bleach on everything, but here I go anyway," the weary, "How long will this last?" and the empathetic, "My poor, sick, sad child." It's December, or The First Month When Everyone Gets Sick, and after hearing from Sarah (they're across the country from us, but that fact matters little to a worrier of my caliber), I've been annoying my family even more than usual by reminding them to really wash their hands, like for at least the entire recommended 20 seconds ("Sing the alphabet, but slowly!" Or, "Sing 'Happy Birthday' twice!"). But some version of the barfing flu squiggled into our home anyway. Wyatt woke upon Sunday yelling for me and saying with a quiver in his voice and chin that his stomach felt "oogie." Of course it did. Sunday was his school's Winter Fair, the one-day, super fun, winter holiday fairyland extravaganza that everyone, including him, looks forward to all year. Woe. It was not to be this year. Marc went to the fair to handle his shift for the little passenger train that would carry children up and down the road, and I stayed home with Wyatt. I texted Sarah, "Dude," followed by a photo of Wyatt in a similar pose to Benjamin on Thursday. She welcomed me to the Galactic Wormhole of Doom and Sh*ttiness ("GWODAS"), and I thanked her for her hospitality. Over the course of the next several hours, I sat on the bathroom floor and read the rest of Laura Ingalls Wilder's On the Banks of Plum Creek to Wyatt. The end of Plum Creek really puts the GWODAS of a short-lived barfing flu (he perked-up before noon) in a modern home into perspective. I seriously cannot imagine living the last hundred pages of that book (or really any of it, but especially the end). The endless swarms of noisily munching grasshoppers who blocked out the sun and ate all the crops two years in a row, Pa's having to walk 600 miles round-trip (once in holey boots) so he could earn some money before winter, twice-weekly blizzards that would easily blind you, swallow you up and freeze you and your children to death, fiery fireballs of tumbleweeds that jumped over trenches to burn your house down, and don't forget all the regular work of being a farmer and homesteader. The whole scenario is its own, special kind of uber-GWODAS, and I am a spoiled whiner by comparison. Comparisons aside, however, the truth remains that community improves whatever GWODAS we find ourselves in. Mr. Nelson helped beat back the fiery fireballs of tumbleweeds to save the the Ingalls' house from burning to the ground; Sarah helped me keep my perspective and sense of humor while I was wedged into the corner on the floor of the bathroom near my inconsolable child on Sunday morning. Community matters, and friendships across many miles matter, too. This story about the Transcontinental Barfing Twins reminded me that I have not yet shared the most recent installment of our Craft Pals exchange (read about earlier exchanges here and here). It's awfully heartwarming. At the end of September, our doorbell rang. The mail carrier had a package for Wyatt. It was from Benjamin, and Wyatt was so surprised and pleased he could hardly contain himself. Benjamin had sent Wyatt the most glorious set of homemade, handpainted story stones, all about a fishing adventure. There's a trout, a fishing pole, a mystery trout that got away, a worm on a hook, an island, a dock, a sailboat, a whale, the weather, an umbrella, a buck-toothed shark, assorted bait, another hook that the mystery trout ate the bait from and sneakily escaped, an octopus, and a jellyfish. This set has all the elements of so many epic adventures, and we have enjoyed many excellent stories thanks to these stones. It took Wyatt and me awhile to figure out what to send Benjamin in return. We were thinking about it, and talking about it, but we were also working on the felted trivets all the time, so the weeks got away from us a little bit. Inspiration struck after our friend, Anne, gave Wyatt a National Parks Journal for writing and sketching. It's a great little book, and Wyatt has been working on drawing plants from our garden and things from his imagination ever since he received it. 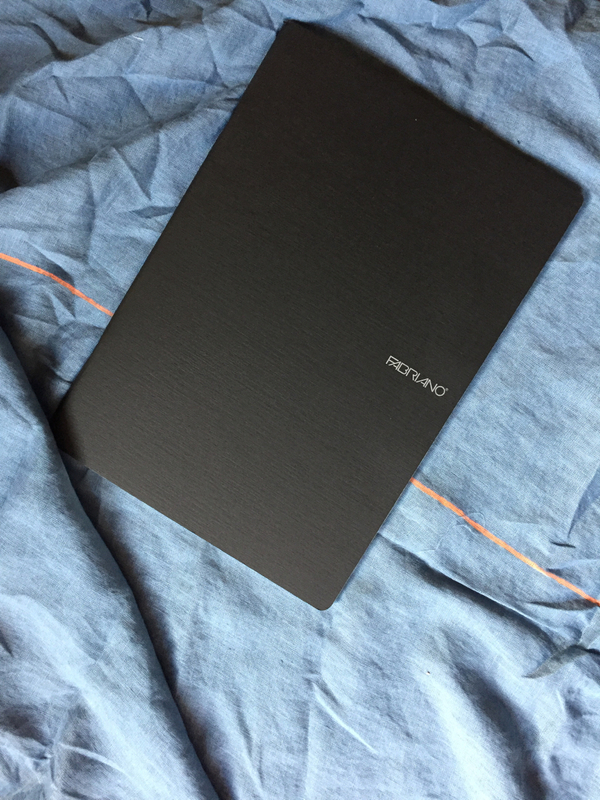 Wyatt thought Benjamin would enjoy a notebook, but not just any notebook. It needed to be special. I suggested we get an unlined blank notebook and decorate it somehow. 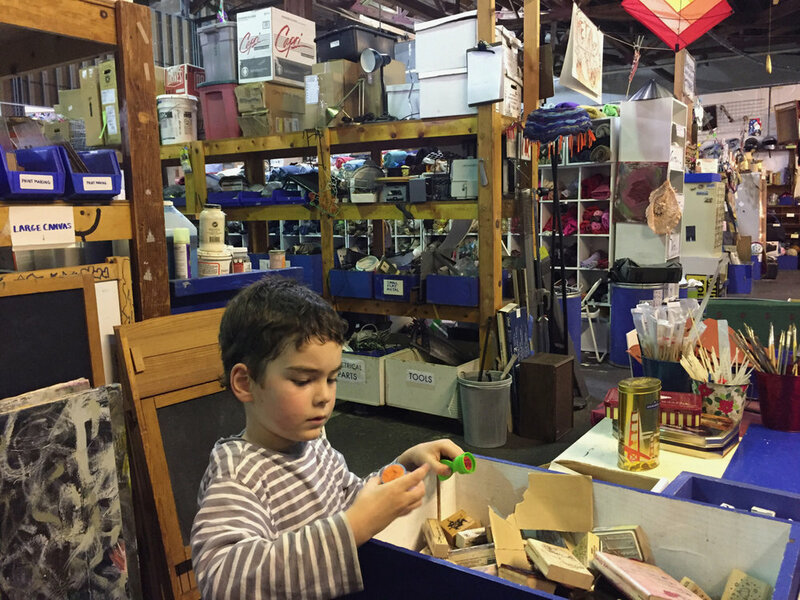 Wyatt agreed, and he and I made a trip to SCRAP in San Francisco for inspiration and supplies. SCRAP is a magical place. The flamingos at the top of this post greeted us outside, and after that, we explored pretty much every corner of the shop. 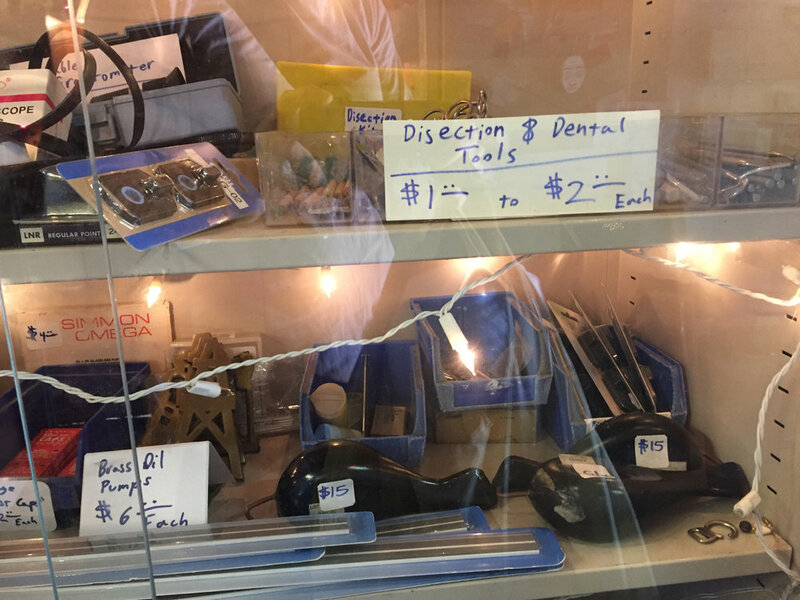 We found everything we needed at SCRAP for the bargain price of $3.15. Everything, that is, except for the notebook (which we were particular about), and the yarn, glue sticks, googly eyes, and thread that I already had. Wyatt decided he wanted to make a cat notebook. And he sketched this prototype. 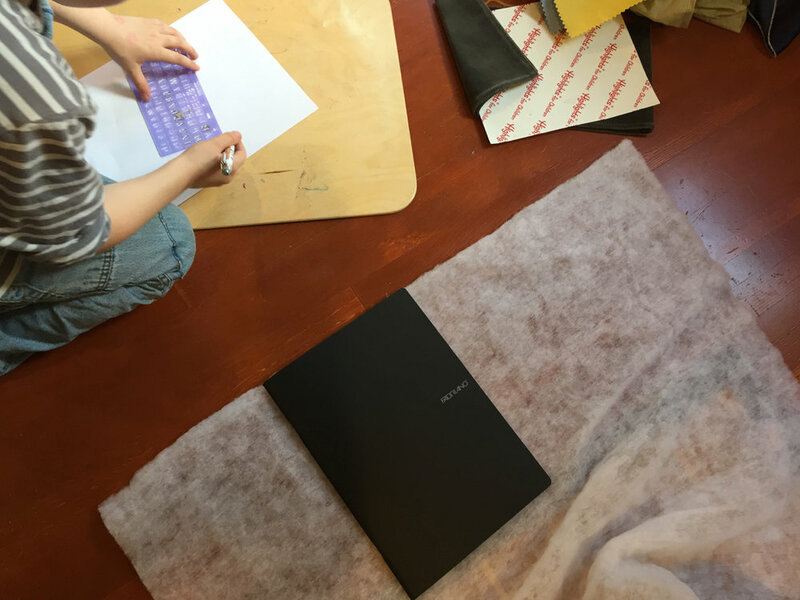 We made the notebook by ironing the fabrics, cutting lightweight batting the same size as the cover, covering the batting-covered cover with fabric, and decorating the book like a cat. Sadly, our hot glue-gun didn't work well for sticking the fabrics together (because it's a low-temperature version, maybe? ), so I did more stitching than I had anticipated, but that was fine. Wyatt finger-knitted the whiskers, tail, closure, and collar. He also chose the button, applied all the hot glue we could use, and held me to a high standard in terms of his art direction. Once the package had arrived, Sarah sent the best ever thank you video from Benjamin. It brought Wyatt the biggest, goofiest grin and giggle each time he watched it. I know I've said it before, but I absolutely love this tangible exchange of thoughtfulness, care, and creativity. I hope everyone reading this post enjoys a healthful December and beyond. But just in case that proves impossible, here's a recipe for pancakes that has proven delicious and easy on recovering stomachs in our house for the last couple of years. The recipe is courtesy of Sweetsmith in Adelaide, South Australia. Gluten-free, dairy-free, and refined-sugar free, these pancakes would also be good in times of good health. Sift flour and baking powder. Mix with all other ingredients. Cook on a griddle (I use coconut oil on the griddle) and flip once they are golden brown on the first side. After both sides are golden brown, eat! The election this week left me sad, angry, frustrated, and broken-hearted. Our president-elect is someone who has shown us through his words and actions that he is someone who believes people who are immigrants, minorities, disabled, Muslim, LGBTQ, female, or otherwise different, are not equal to him, should not be treated with respect, and should not be afforded the protections of our laws. He also thinks global warming isn't real. More than ever, those of us who value equality, tolerance, civil rights, the environment, and frankly, personal decency, need to act and lead by example from wherever we are. I was inspired this past week by a post that author Catherine Newman wrote: "Service is the road to happiness...we can support the most vulnerable people in our communities, either in established ways—volunteering with organizations that serve youth and queers and the poor and the elderly and other people in need who need our time; involving ourselves in local politics and issues; donating money to local causes we believe in—or in creative ones." She went on to explain how her friend, Kate Schatz, delivered flowers to the Islamic Center of Alameda. I read Catherine's post while I waited for Wyatt to finish chasing the pigeons at the Ferry Building on Friday. I thought to myself, we could do that. Before heading back to the muni station, I Googled Islamic organizations and mosques, and I found a mosque in the Tenderloin. Wyatt and I stopped to buy some flowers from a woman outside the Embarcadero subway entrance on Market Street. I didn't ask, but Helena, the florist, shared with us that she is from Poland and has lived and worked in this country for many years. (I suspect she might have been having a terrible election week, too.) She carefully boxed the arrangement we had chosen so it would survive the trip on the train, and I wrote a little card. Because Wyatt prefers to use all forms of public transit whenever possible, he insisted we take BART to Civic Center. Once at Civic Center, he complained bitterly about the ride being too short, but the busker crooning Carole King's "It's Too Late" took his mind off it. We began to make our way up Market Street. Along the way, we watched a police officer fall off the the back of his mountain bike as he tried to perfect a wheelie ("Someday I'll get it!" he said cheerfully) while his partner shook his head and rode on, we saw some homeless people sleeping, some asking for money, and a variety of "activity" as we walked up Jones Street. Once we had arrived at the address, I realized I didn't know how to deliver flowers to a mosque. It was time for prayer, and there were men hurrying in, removing their shoes, and washing their hands. Wyatt and I were definitely out of place. I said to the man closest to me at the entrance, "We have these flowers to give to the community." He looked at me and said, "But I don't know any of these people." Me neither. So I said, "Well, I don't want to interrupt...would it be okay if I left them here by the sink?" And he replied, "Yes. I think that would be fine." So that's what we did. On our way out, Wyatt noticed some mothers wearing headscarves sitting on the sidewalk with children in their laps. They were holding signs asking for money. "Are those KIDS homeless?" he asked me once we were down the block. "Maybe," I said, and I could feel Wyatt's little hand tighten in mine it as the weight of their reality hit him. Does empathy start when we notice an aspect of ourselves in someone who is suffering? I can't know for sure, but we have been discussing homelessness off and on ever since. There is a lot of work ahead of us. And as Wyatt's and my Friday flower delivery showed, sometimes we won't know what we're doing and we'll feel awkward, but we will do our best, and we will learn. I realize that dropping off flowers isn't the only answer, but it felt good to offer a small kindness directly to people who, as I told Wyatt, "are probably even more upset about the election than we are." Marc and I are also looking at how we can better impact our community and country in terms of volunteering our time and donating money to established organizations. We will also be vigilant in contacting our representatives in an effort to hold them accountable. Meanwhile, I've been a terrible cook this week. Awful news affects me on pretty much every level, and this week I lost interest in eating anything other than pretzels, which is bad news for the people I live with. But we have been muddling through thanks in part to some homemade Lara-esque bars Wyatt and I made last on Sunday while the cookies for the Hillary volunteers were baking. It seems like a lifetime ago. Here's the recipe in case you want to make the bars, too. Put all of the ingredients into a food processor and let it run for several minutes, until everything is in tiny pieces and has come together. Line a rimmed baking pan with waxed paper (or parchment) and press the mixture down evenly into the pan. These are yours to make whatever shape you want, so however thick you want them, go for it. Cut them in whatever shapes you like. Refrigerate the pan, and eat up once they're firm. You do need to keep the bars refrigerated, or they get smushy. I love knowing people who are experts at their craft. In an age when it's all about who has the loudest voice or best story propelling their marketing, my favorite master crafts people and professionals are the ones who consistently and confidently do great work, have little need for fanfare, and are happy to share about their process and projects when I ask. These are the people I love to have as my teachers. My favorite master of woodcraft (and a favorite person in general) is Al Henry. 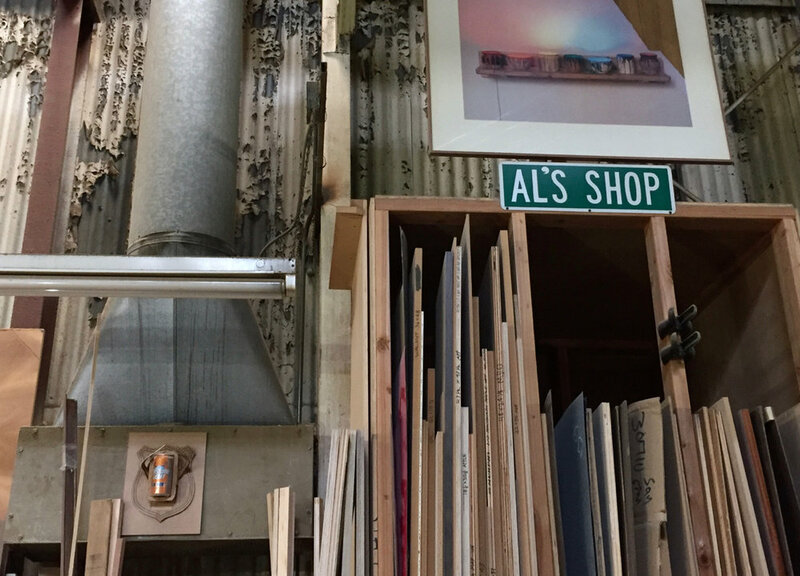 Al has described himself to me as a cabinetmaker. Doesn't that sound infinitely practical? I can attest to the fact that Al designs and builds beautiful, functional, and as far as I can tell, perfect cabinets. But cabinets are just the beginning of what he can make, and has made. Work tables, desks, toys, unique bookshelves, and stunning large-scale inlaid and woven artwork. I'm pretty sure that if something can be made out of wood, Al can make it, and make it beautifully. A month or so ago, I was on the hunt for a step-stool for Wyatt (who has outgrown his Learning Tower). I went to all the usual places one might find a step-stool, but none were the right height. I then checked Etsy, and I found someone who'd make me a custom-height stool. 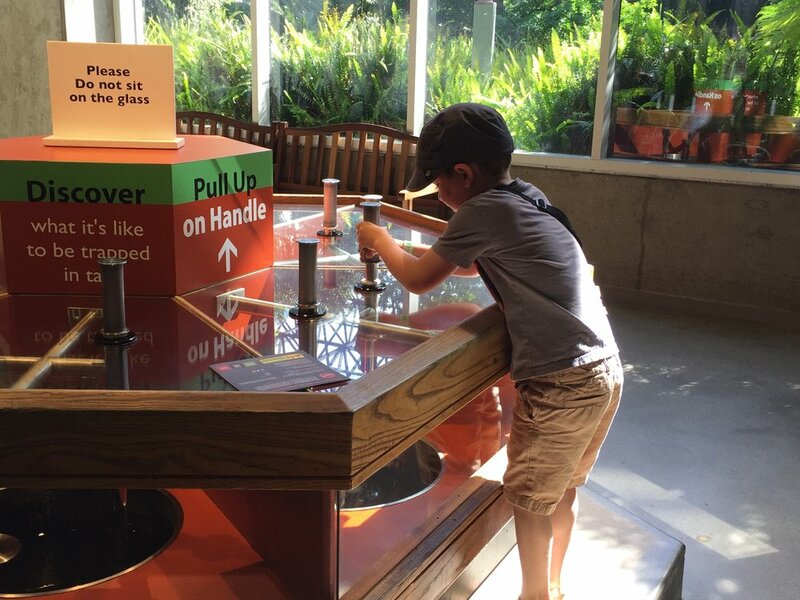 Just as I was about to place an order, though, I wondered if Al would consider doing a step-stool project with Wyatt and me. It seemed like it might be too small a job, or maybe too much to ask of him to have our "help." But I ultimately concluded that I should let him decide for himself whether he wanted to do it. Lucky for us, Al said he would be happy to help. And within the span of a few text messages, he had vastly improved on the step-stool design I had imagined. Wyatt and I went by Al's shop after school one afternoon to build the stool. Before we arrived, Al had pre-cut the pieces and drilled pilot holes in all the right places. Wyatt and he assembled everything. As you might imagine, this is no ordinary step-stool. The pieces fit perfectly, reflecting the precision of an expert cabinetmaker. Al also placed tape on the front piece so that Wyatt could write his name. Al then carved Wyatt's "signature" with his dremel tool. Wyatt sanded the edges of the stool when we got home, and has been taking impeccable care of the stool ever since. As he says, "There aren't many kids who have a step-stool as nice as mine that Al built with them!" He went on to create and send Al's thank you card with unmatched exuberence. This step-stool has changed our kitchen life. Wyatt can now wash dishes and cook with ease. When we saw Chef Kellie, culinary expert of Chicks & Love Pizza Patio, last week, she asked Wyatt if he would like to know what she always taught her culinary students. "YES!" he said, and then he stood listening with all his being. "Make every bite a delight," she said. He nodded solemnly. She went on to explain that when she makes anything, she looks carefully at what she's creating and her goal is to make every single bite delicious. Wyatt has taken this motto to heart. With this guiding principle and his step-stool, he has become a force in the kitchen. Our latest creation was Delicata Squash Nachos. And before you make a weird face, just try them. Remember, I am not the biggest fan of squash. In fact, I bought delicata squash with deep skepticism tempered only by a willingness to give them a try, just this once, after hearing people sing its praises. 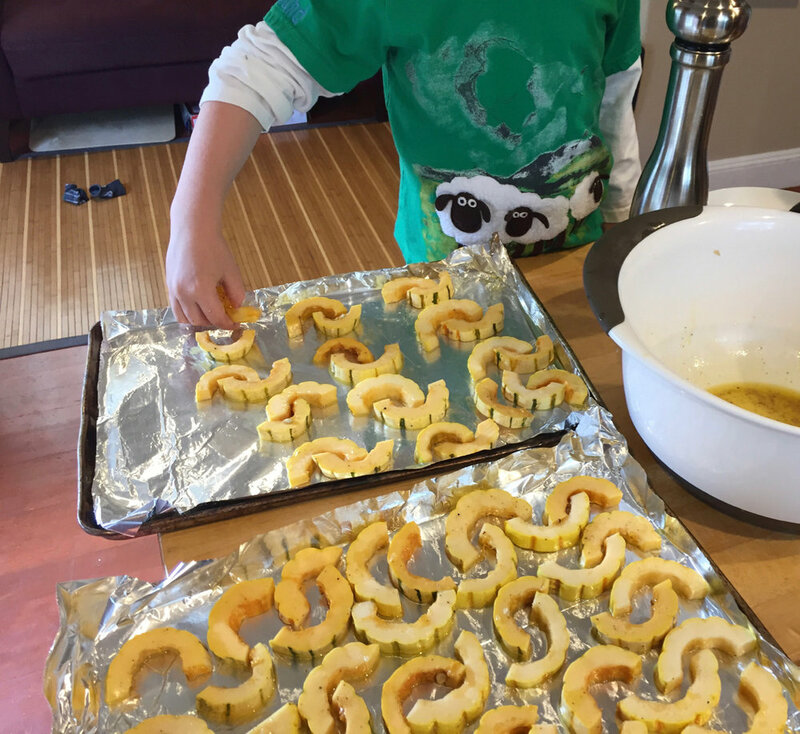 Boy am I glad I did, because delicata squash is show-stoppingly good when sliced into little crescents (unpeeled!) and roasted. Those slices were so good out of the oven that Wyatt and I had to summon a lot of willpower not to just eat them all off the baking sheet. And before I forget, be sure to save those seeds! Rinse them clean of squash goo, let them dry, then toss in a bit of olive oil. Roast for 20 minutes or so, at 325-ish stirring occasionally, until they are golden. Sprinkle with salt while they are hot. They're better than pumpkin seeds. We sort of followed this recipe, which is to say we followed the directions for roasting the squash. Then we layered on top of the mountain of squash crescents most of a can of drained black beans, grated cheddar and monterey jack cheese, and homemade green enchilada sauce. We broiled the whole mess until the cheese melted and started to brown. Once out of the oven, we added mild salsa and slices of ripe avocado. We served our "nachos" with sprouted brown rice, but I'm sure there are more exciting accompaniments. I understand that delicata squash season is short. Go get yours before we eat all of them up. "Mom. Do you know what I like about hot glue guns?" "Yes, but I really like that you don't have to wait for the glue to dry." I've been hearing for the last few years from Wyatt's teachers that children have a seasonal rhythm. In the spring, the children begin to "breathe out." They need more space to move around, group projects become more challenging, and they are less able to focus. 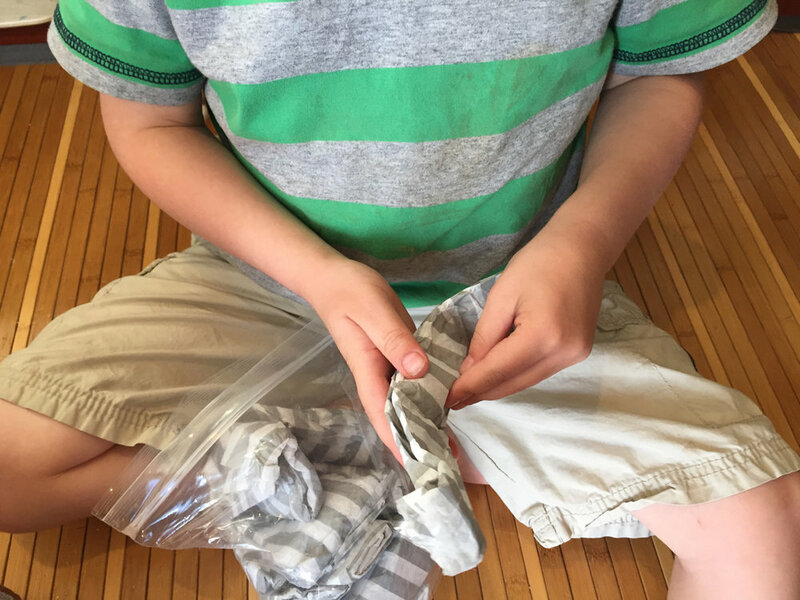 The exhale continues through the wildness of summer, and in the fall, the children begin to "breathe in." Their energy shifts, they're ready to begin to work together, and they can maintain more focus. Until last week, this mystical explanation struck me as a post-hoc rationalization for "Why We Have Summer Vacation." 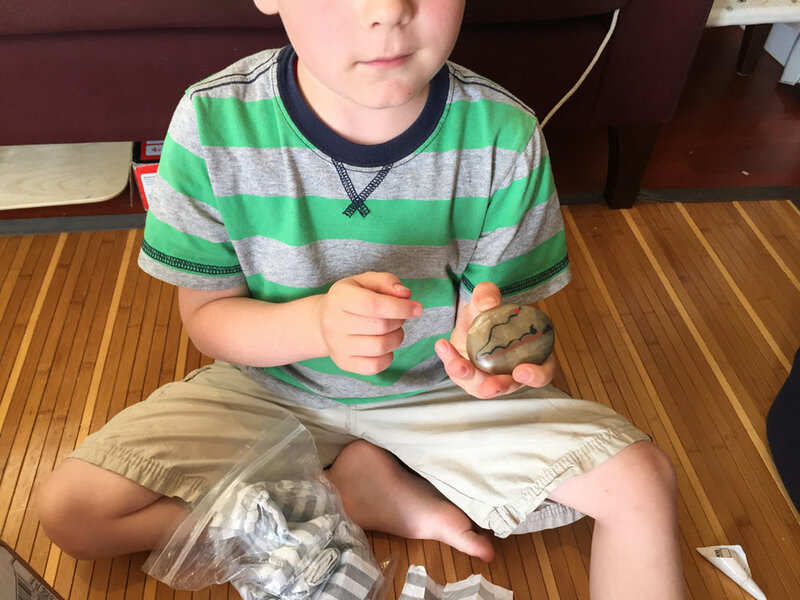 But last week, I began to question my skepticism of the "seasonal childhood rhythm" when, to my surprise, every afternoon, Wyatt requested we do increasingly complicated crafts, and then he actually worked on them for hours. His attention and intensity were astonishing. We started saying we were having "Crafternoons." Fortunately, we had a focus for our Crafternoons. 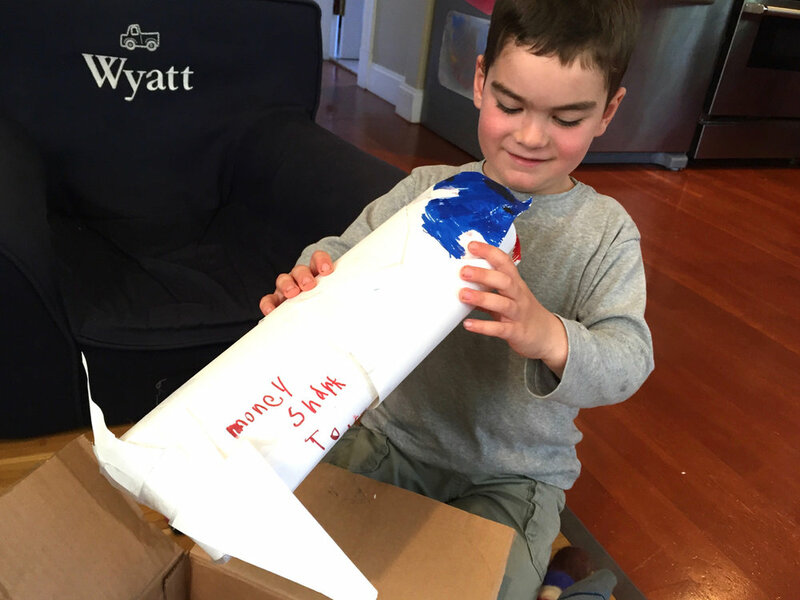 Before leaving on vacation, Wyatt received a box from his craft pal, Benjamin. Benjamin had made him a money shark (for all his toy sale earnings), a ladybug, and a gnome. Everyone I care to know would have been thrilled to receive such perfectly thoughtful gifts. Wyatt began planning presents for Benjamin while we were in Massachusetts. He basically got my mother's permission to raid her stash of googly eyes and fancy pipe cleaners, and then he stowed them in my suitcase. He started brainstorming what he could make out of egg cartons. Our first Crafternoon involved making and photographing sparkly caterpillars. It didn't take long for me to just hand over the (low-temperature) glue gun and figure Wyatt would learn soon enough how to keep his fingers from getting burned. I assisted as needed, but he needed very little help. 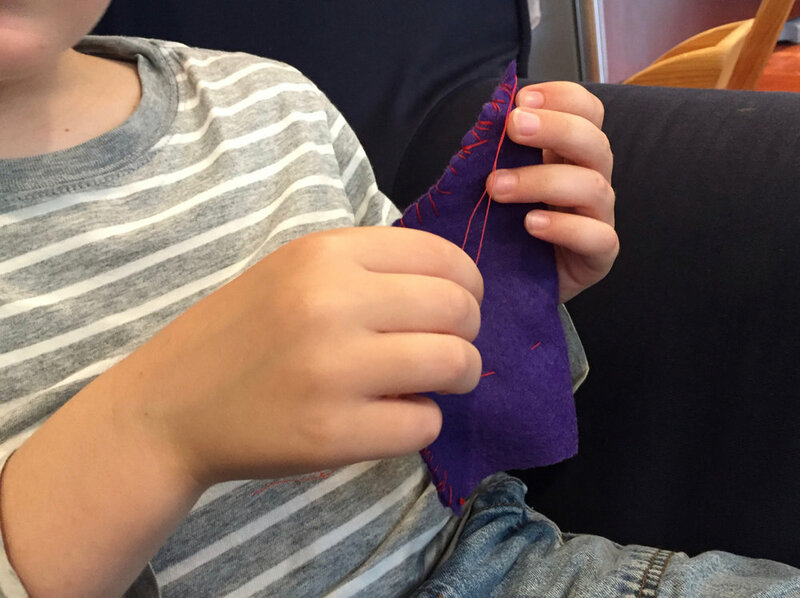 Our second Crafternoon involved sewing a gnome, in the style of the gnome he had made at school last year. 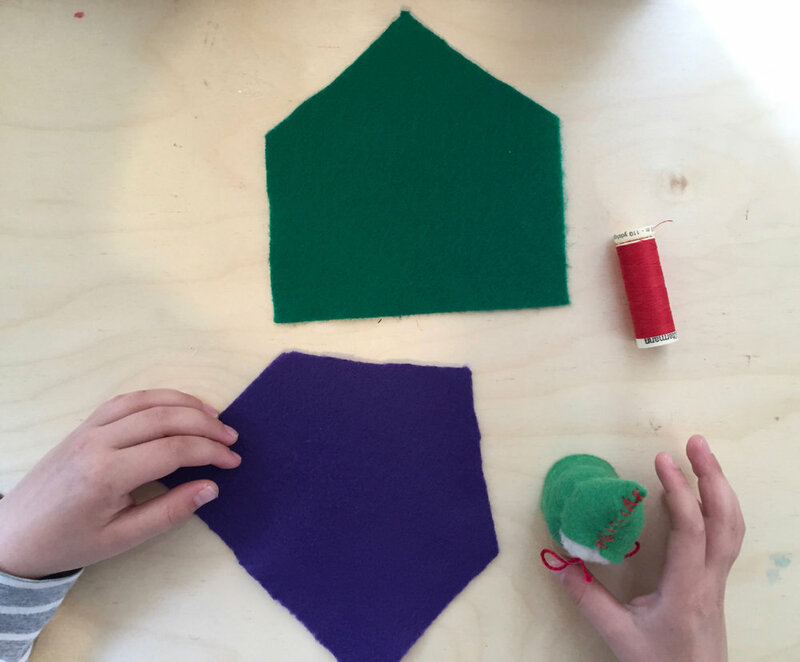 If you cut a piece of felt in the shape of a simple house, you can make two overcast stitch edges and one running stitch neck. A little stuffing, cinch of the neck, and a trimming of felt to make a face space, and you're there. Our third Crafternoon involved a ceramics painting playdate at a local studio, more sparkly caterpillars (because he wanted one for himself), and putting Benjamin's presents in the mail. 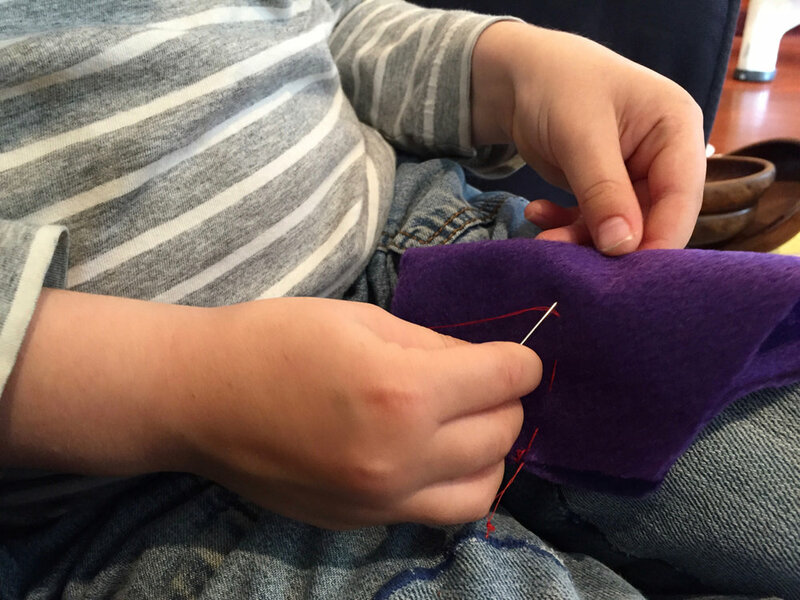 During the fourth and fifth Crafternoons, Wyatt learned to knit: "In through the front door, running 'round the back, peeping through the window, and off jumps Jack!" Thanks to Maja for that rhyme. Today, we were out of egg cartons. Even worse, we didn't have much time for Crafternoon. All Wyatt wanted to do was squish into some clay on the counter while I made dinner. But killjoy that I am, preferring my dinner silt-free, I redirected him to the glue gun. He happily busied himself bedazzling some felt...to make another gnome. It's probably a good thing that school starts Wednesday. "Is tomorrow Father's Day? Dad. We are definitely not doing ANYTHING special for you for breakfast tomorrow." Wyatt has almost moved on from sharing surprises the moment he hears them. Lately, he's into the (very obvious) "misleading" statements that reveal the surprise. After breakfast, we headed down the street to see the aftermath of the terrible fire that Wyatt and Marc had witnessed Saturday afternoon. On Saturday, Marc and Wyatt had gone out to the park, but soon after, they noticed a lot of smoke coming from down the road. They followed the smoke and commotion to a five-alarm fire where flames were pouring out the top story of what turned out to be six burning buildings. According to news reports I have read, no one was hurt. But the whole scene was intense and sad. Wyatt announced when they got home, "Mom. I haven't gotten enough snuggles from you today," and he proceeded to sit on my lap for over an hour while peppering me with questions about fires and firefighters. On Sunday, the devastation was still very much on Wyatt's mind, so Marc suggested we revisit the scene. Nearly 24 hours later, the buildings were still smoldering in places. And, now, more than two days after the fire, Wyatt is still processing what it means to be a firefighter. He thought he knew, but now he understands that he truly had NO IDEA what it entails. The combination of flames coming out of buildings and his beloved Cole Hardware, gutted and unrecognizable, was sobering. We spent a long time on the sidewalk watching all the activity. Eventually, we headed home. Later in the day, we picked up giant sandwiches from Ike's and ate them at home in our garden on lawn chairs. Then, we lounged on the lawn chairs. Next, we walked (and some of us also used our kick-scooters) to get ice cream. I should note that all of these activities were aspects of Wyatt's dream day, and he suggested all of them. Fortunately, Wyatt and Marc like many of the same things, so this plan worked well for Father's Day. On our way back from ice cream, a fire engine drove by. As the firefighters rang the bell, Wyatt stopped and looked. Without even a hint of a smile, he waved earnestly, reflecting his new and deep respect. I thought to myself as I saw him wave, "The kid's growing up." But the truth is, all of us are offered opportunities all the time to grow-up. As adults, if we're present and ready for it, we can gain new perspectives and work to become our best selves. Children, on the other hand, aren't ready to author their own stories in the same way. It's our responsibility to help them. As I reflected on the big and small things that had punctuated Father's Day, I found myself especially grateful that Marc is Wyatt's father. I can't think of a better person to help him write his story. We don't listen to broadcast radio when Wyatt is around because we think he deserves to feel like the world is good and that that he is safe. With the news, either we don't know what will be reported, or we can guess what will be reported, and we don't want him to hear it. Take this weekend for example. How could we explain to our five-year old the terror attack on a gay nightclub in Orlando? Or references to the shooting in San Bernardino? Or Sandy Hook Elementary? Or any of the other recent mass shootings? I can already imagine Wyatt's questions. So we just won't go there, yet. But it won't be long before Marc and I will have to try to explain what is going on with people, guns, and some people with guns in our country. I wonder whether there will be a meaningful shift in United States gun policy anytime soon. I haven't given up hope (or voting, or contacting my representatives), but if 20 dead six to seven-year old children didn't spur a change in policy, I don't know what will. Because I'm not sure what more I can do to support legislative changes, I've also been thinking about how to raise a person who can help defuse hatred, stop violence, and end oppression. So far, I have identified three qualities to model for Wyatt, with the hope he'll take them on and make the world a better place. They are: Civic responsibility, empathy, and gratitude. Civic responsibility is a relatively easy one compared to the other two. For example, we already take Wyatt with us to vote in every election, we participate in volunteer activities in our community, and we do our best otherwise to be "responsible citizens." As he gets older, we may get more involved in organizations and issues, but I feel like we're off to a good start. Empathy is more challenging for me than civic responsibility, and it is the key to bridging differences and connecting with others. I've been working on my empathy skills through parenting classes. I've also become aware of the lenses through which I see the world, and I continually work to adjust them. I used to read a lot to educate myself and gain new perspectives, but lately, I've moved to reaching out in real life to new friends and...listening to podcasts. My favorites in this realm are: Show About Race, Embedded, Code Switch, 99% Invisible, 2 Dope Queens, and More Perfect. Gratitude is just as important as empathy. In addition to improving one's outlook on life, I believe it's an antidote to entitlement. I think gratitude starts with politeness and thank-you notes— taking a moment to appreciate a kindness—and it grows from there. I've been cultivating a gratitude practice over the past year, and while I'm much less consistent than I once was with my 5-Minute Journal, I now regularly notice more things throughout the day that I am grateful for. Marc and I also tried to start a gratitude practice as part of our family dinner time: "Three Things I Liked About Today." But Wyatt quickly decided he didn't want to play, and let me tell you, there's very little joy that springs from a practice that is punctuated by whining and pouting, so we have put that particular activity on hold for now. There are so many ways to feel and show gratitude, and it benefits us to find them. Sometimes it's as simple as giving someone a smile or a wave, and sometimes it can be a larger effort. Wyatt's and my most recent project was for our friend who's a checker at the grocery store. According to both of them, they are "best friends." They connected upon first meeting, and now I text her when we're coming to the store so we are sure to see her while we are there. She has been so generous—I can't even begin to explain all she has given us, in addition to the new Spanish vocabulary words she teaches us each week. Unfortunately, she has been having trouble with her feet recently, and foot trouble is no good for someone who is on her feet all day. Wyatt and I concluded that while we couldn't do anything to heal her feet, we could make her some slippers to warm them and to show her how much we appreciate her. Wyatt selected the yarn for the slippers himself. I would have never, ever chosen the colors, but I should have. The contrast worked beautifully. But then I did what a knitter should never, ever do: skip the gauge swatch. 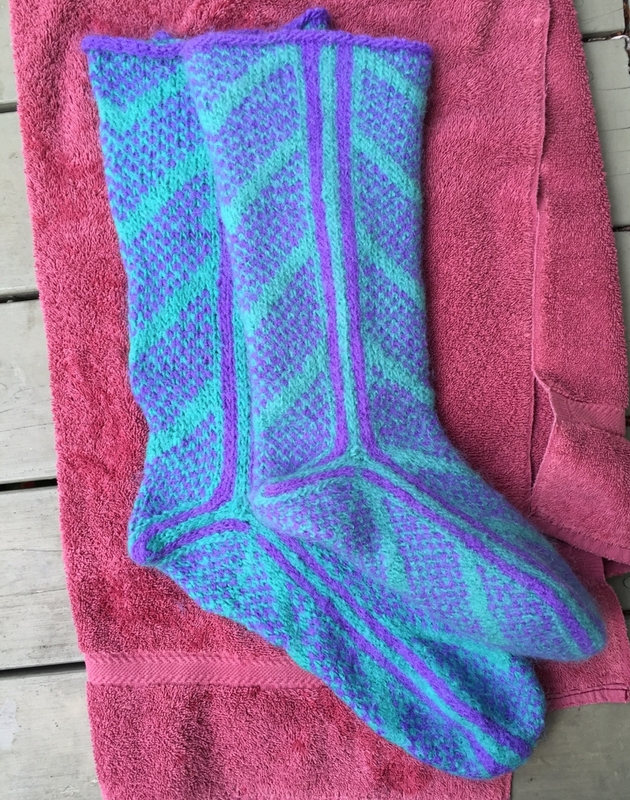 In my defense, I had made slippers from this pattern once before in what I thought was a comparable yarn. But the yarn wasn't comparable after all. The first slipper turned out about twice as big as it should have been. It was loose, floppy and unwearable. But rather than ripping it out, I decided we should try to save it through wet felting. Wyatt and I had hand-felted soap before, and after I did a little research, I felt like a (controlled) felting job might give us a winning slipper. Fortunately, the felting worked, and the resulting slipper was far better than the plain-old knitted version. So I moved on to knitting the next slipper, and then Wyatt and I felted that one, too. Once the slippers were dry, we wrapped them in Christmas paper and a big bow (at Wyatt's insistence), and we hand-delivered them to our friend at her check stand. She later texted me a photo showing that they fit. Not bad, right? Obviously, handmade slippers won't change gun policy or bridge the wide political rifts in our country. But the slippers represent care, and caring matters today as much as it ever has. While the news flies fast and furious and the hatred so prevalent in this election cycle swirls, I plan to turn up my empathy and gratitude, and to exercise my vote in November. With any luck, some of these practices will rub off on my kid. *Thanks to Wyatt's birthday twin, Addie, and her parents for this amazing Bowie Tee. It's his favorite. One evening after work, over a decade ago, I shared an elevator with a former boss of mine down to the parking garage of our Los Angeles law office. I have no memory of what we were discussing in the elevator, but I will always remember that whatever it was prompted him to ask me once the doors opened, "Do you want to know the meaning of life?" I remember looking at him sort of sideways, equal parts dubious and curious, and saying, "Of course I want to know the meaning of life. What is it?" He said, "It's relationships." I remember falling silent, thinking to myself that the answer did not sound profound enough, and then wondering if he might be right. All these years later, I'm pretty sure he was right. It seems like the best things in life come out of relationships we build and connections we make with other people. 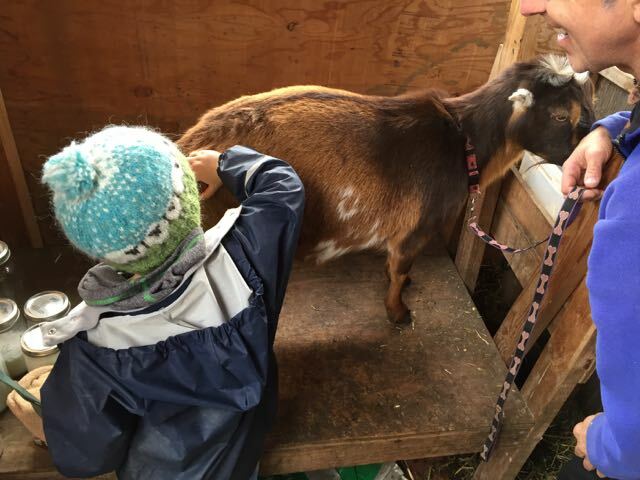 For example, this weekend alone, thanks to fantastic friends and acquaintances, we enjoyed a parade, a farm visit, a cheese party, and a food swap. On Saturday morning, Wyatt, Marc and I attended the Chinese New Year mini-parade. It's the greatest, most low-key, kid-friendly Chinese New Year celebration in San Francisco, and it seems like hardly anyone has heard of it. I only know about it because my friend, Raejean, took me to it one year to teach me photography basics. She and I had the best time, and I got some good photos, too. Raejean moved away several years ago, but thanks to her, we now take Wyatt, who is already looking forward to next year's parade. A couple of months ago, I was listening to the Local Mouthful podcast, and the hosts were discussing the magic of Food Swaps. Intrigued, I looked online to see if we had one in San Francisco. When I found one, I asked to be added to the mailing list. The date of the swap has been on my calendar for a few weeks. But the event wasn't until the afternoon, so there was time for some fun in the morning. Some cheesemaking, perhaps! 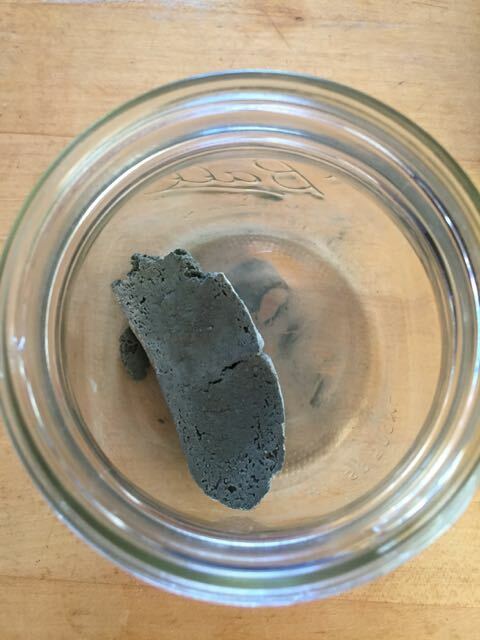 Darcie and I decided to make a surface ripened blue cheese (like we had learned in our workshop). I invited another friend who is interested in learning to make cheese, and her daughter, one of Wyatt's friends from kindergarten, to join the fun. Darcie's wife, Lauren, planned to join us, too. Even though it seems impossible, our day got even better when Darcie texted me that she had made a goat milk connection. Could Wyatt and I meet her and Lauren at 8:00 a.m. in Oakland to milk some goats? The answer was a resounding, "YES." 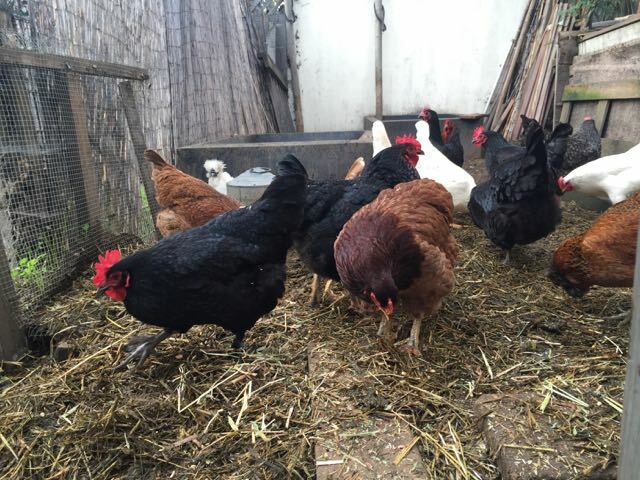 We got up early on Sunday and were on time to the urban farm where we met the farmer, his chickens, and his goats. The farmer milked the goats, I gave milking a try, and then we all enjoyed a goat's milk tasting before we took our fresh milk back to San Francisco to make some cheese. 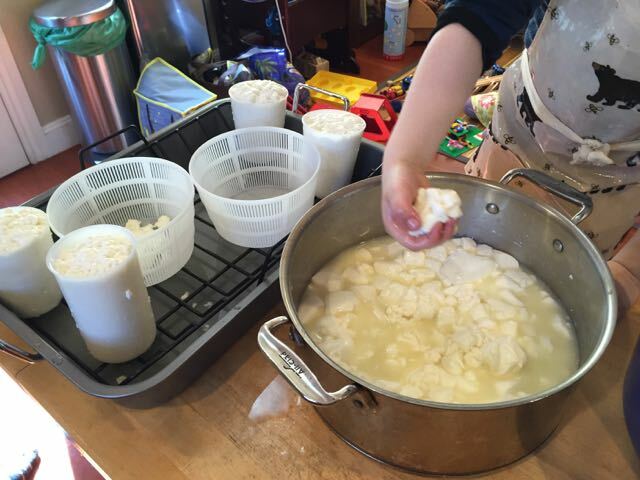 When we got back to our house, our cheesemaking party began. We made a surface-ripened blue camembert style cheese from cow's milk and also some blue goat's milk cheeses, using the blue mold that I cultivated on our homemade sourdough bread. We also started a batch of fresh chèvre, because who wants to wait a month or more before tasting any of the cheese? When we were done straining the curds from our blue cheeses, we made a fast ricotta out of a mix of the whey of both types of milk. We also enjoyed a delightful array of amazing snacks, pretty much all day long. When cheesemaking was over, Marc, Wyatt and I pulled together the ten eight-ounce jars of organic cultured cream cheese that I had made to trade at the food swap, along with the rice salad I had made for the potluck (I substituted sunflower and pumpkin seeds for the pine nuts in the recipe). We headed over to Sports Basement on Bryant Street, and we proceeded to set up our cheese shop. While we were swapping food, we met an entire room of delightful makers and tasted their delicious wares. I also got to meet a friend I had only previously known on Instagram! 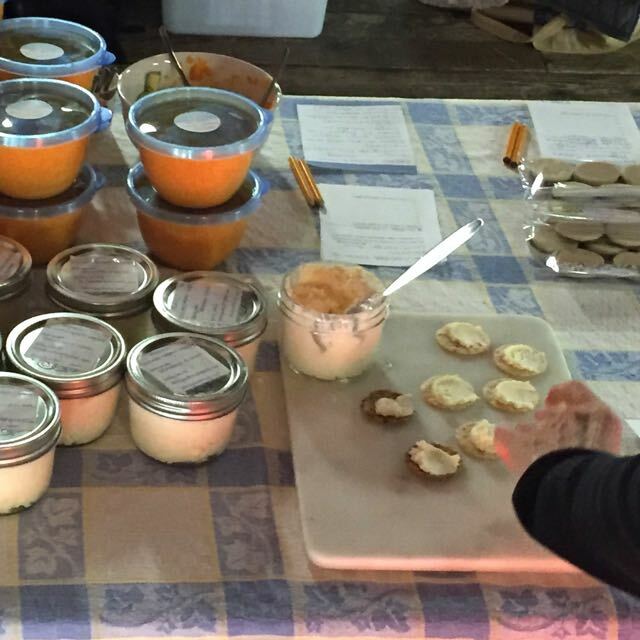 We "sold" all our cheese, including our sample jar! Obviously, our entry was a huge hit and it was fun to hear people marvel at how they had only ever eaten store-bought cream cheese, and how different (and better) fresh tasted. In exchange for our cheese, we got plum butter with grand marnier, apricot jam, peppermint creams, vegan lox, carrot ginger miso dressing, garlic confit, pickles, apple ketchup, baba ganoush, and some handmade soaps. Regardless of whether you want to make cream cheese to trade, share, or keep for yourself, it's very easy to do, as long as you're willing to maintain a kefir grain cheese pet. (They're really not that much trouble. I promise.) I found the basic cream cheese recipe in David Asher's book, The Art of Natural Cheesemaking, and I tweaked it only slightly by replacing some of the cream with whole milk. Mix the cream and milk together with the kefir grains or prepared, strained kefir in a quart jar. Loosely screw on the lid of the jar. Let the jar sit for about 24 hours at room temperature. You're basically making crème fraîche, so keep an eye on when the mixture has thickened to that consistency. Spread the cheese cloth evenly over a colander that you have placed over a pot or bowl and pour the thickened cream and milk mixture into cheese cloth. Knot the cheese cloth at the top and hang it from somewhere in your kitchen with a pot or bowl below to catch the whey. I hung the knotted cheese cloth from a wooden spoon that I placed across the top of a tall pot. Let hang for about 8 hours at room temperature, or until you have the consistency of cream cheese that you prefer. Add kosher salt to taste. Store in a covered container in the refrigerator. You may notice that after your cream cheese has sat in the refrigerator for a day or more that it becomes slightly effervescent. That's totally normal. "Mom. I don't like it when you put my rain pants on top of my lunch bag in my backpack...We go outside to play before lunch, but we have snack before that. When I take my placemat and napkin out for snack, I have to pull out my rain pants, and I don't like having to do that." It is really remarkable to watch a very young person become more autonomous, thoughtful, and engaged in the day-to-day rhythms of life. When Wyatt told me about the rain pants, we were hurrying to get out the door for school. Fortunately, his comment caught me so off guard that I stopped for a moment and thought before responding. "Oh," I said after a beat, "I didn't know. I thought I was helping by putting them on top. Let's move the pants to the bottom so it's better organized for you." My reward for that moment of parental awareness was Wyatt's pleased expression of satisfaction as he helped me repack his bag. Even though I know there's a lot more to it, I often feel like my "conscious parenting" amounts to whether I'm able to timely and lovingly manage the rhythm of our days. Some days are better than others. When I shout in exasperation, "I SAID HURRY UP! WE ARE SO LATE!" I know it helps no one, and yet, I still do it more often than I'd like. Things also run less smoothly when Marc is out of town. This past week was no exception. One day I overslept, by a lot. Another day, I noticed Wyatt's jacket was missing just as it was time to leave for school. The futile, frantic hunt around the house for the jacket resulted in our forgetting the broccoli we were supposed to bring for soup day. But thanks to a swiftness and focus I have never before witnessed in my child, we were on time for school the day I overslept. And thanks to his gracious teacher, we were immediately forgiven for forgetting our soup day vegetable. As she said, "The broccoli probably just wanted to stay home." Maybe another way to describe the new autonomy I'm witnessing is to say that I'm watching Wyatt wake up to the world. Just this week, we have had conversations about life, death, peoples' battles with cancer vs. knights' battles with dragons, artistic expression, freedom, fairness, differences, and equality. These are the topics that arise when David Bowie dies of cancer and we prepare to celebrate Martin Luther King Jr. Day within the same week. After I told Wyatt that school would be closed Monday for Martin Luther King Jr. Day, he did not give me his usual, "Yay! Three-day weekend!" cheer. Instead, he asked, "Why is there a holiday? Who is Martin Luther King Jr.?" I gave him a (hopefully) age-appropriate explanation about Dr. King's importance to the Civil Rights Movement and how Dr. King dedicated his life to achieving freedom and equality through nonviolence. Wyatt's question then became, "How will we celebrate Dr. King?" I wasn't sure. I started researching children's books on Dr. King (this list and this list were helpful). I decided to order A Sweet Smell of Roses, which presents the leadership of Dr. King through the eyes of children. In the story, two elementary school-aged sisters sneak out of their home early one morning to join Dr. King on a march. The children experience community with their fellow marchers, and they experience hate from white bystanders who tell them they do not deserve to be treated equally. The illustrations are strikingly beautiful and full of emotion, and the words of the story are easy to understand and wonderfully lyrical. The story ends when the girls return home to their (understandably) worried mother who hugs them and lets them tell her all about the march. The day the book arrived, Wyatt snatched it out of the box, snuggled next to me on the sofa and insisted that we read it over and over again. We discussed the pictures, including the races of the people in the pictures, and the story. He announced, "This is a great book. I love it except for that page where those people are mean and say that Dr. King and the other people aren't equal. That's REALLY not good." In addition to books, I researched service projects and marches that we could join on the holiday itself. But none of the activities I found seemed exactly right for a child who's still shy of five years old. In the end, we opted to spend the morning working to beautify our community by picking up trash. 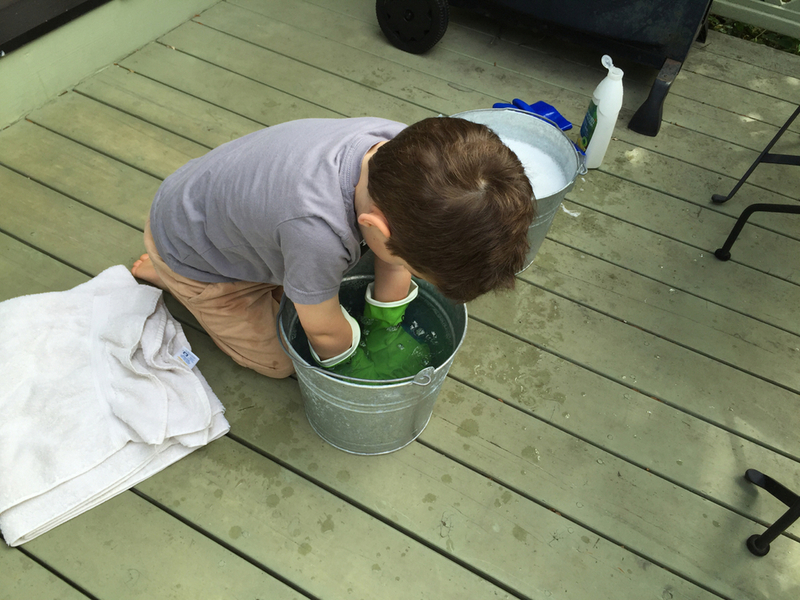 Because activities with kids are so often improved by accessories (and because trash is gross), I wore disposable gloves and Wyatt wore disposable mitts. I mostly carried the big trash bag, because as Wyatt said, if he carried it, it would drag on the ground. While we walked through our neighborhood and into the next, we picked up everything we found--from cigarette butts and candy wrappers, to yogurt containers and coffee cups, to clumps of paper towels and cardboard cartons. We also said hello to everyone we passed, none of whom we knew. Three people thanked us for cleaning up, and with each "thank you," Wyatt stood a little taller. One of the people who thanked us was a shopkeeper who came out to give us drinks and new disposable gloves because, as he said, he saw how hard we were working. At the end of our walk, about a block from home, Wyatt looked at the bag of trash we had accumulated and said, "Mom! That bag must be so heavy for you! Let me carry it." At that moment, we were within earshot of a couple of construction workers. Wyatt's comment was just too much for them to handle with a straight face. They tried to stifle giggles, said a few words in Spanish to each other and went on to commend Wyatt's efforts loudly in English, "Look! Such a strong, strong boy!" Fueled by those compliments, Wyatt walked with the trash bag over his shoulder for about a half a block before giving the bag back to me. As we stuffed the bag into a trash can, I told Wyatt how happy I was with our good work. I felt satisfied that, in our own little way, we had contributed to creating a Beloved Community, thereby honoring a great man who dedicated his life to achieving freedom and equality. Sitting among hundreds of little humans at the Davies Symphony Hall Concert for Kids this morning, waiting for the concert to begin, I started to think about climate change, refugees, mass shootings, and what being an American may mean today. I thought about how we all need to do so much better, in so many big ways. And I realized that my sphere of influence had never felt smaller. As we left the concert, Marc (who was still in Cincinnati) called to say that our elderly neighbor, Ed,* fell in the bathtub today, and his wife, Helen, couldn't help him up. I immediately called Helen. She explained that in addition to calling Marc, she had gone across the street to a neighbor she saw was home, but who didn't answer the door. Helen said she continued down the street to another neighbor who fortunately came right over, with his tiny daughter in tow. He helped a shaken and exhausted, but seemingly unhurt, Ed out of the tub and into bed to rest. As Helen said, "It was really scary. It has been an awful morning." Wyatt overheard my end of the conversation, and he became visibly concerned about Ed. I explained what had happened, and that Ed seemed okay now, just tired. Wyatt supposed, based on his own experience, that Ed had been standing up and playing around in a wet bathtub with the water running when he fell. I put on my best serious face and opined that it was probably just an accident. On our Muni ride home this afternoon, Wyatt and I talked about Ed and how we hoped he was feeling better. Somehow during this discussion, we decided to bake Helen and Ed an apple pie. Maybe it would improve their day. Or maybe they would just have pie. Either way, we figured it was worth doing. The pie turned out beautifully. We carried it over while it was still hot. Helen beamed at us when she opened the door, and she said the pie would really brighten up the instant chicken soup she was having for dinner. Ed was still resting and didn't feel like eating. She mentioned how lonely she had felt during the day, so we promised to stop by tomorrow, too. Wyatt and I walked back home and after dinner, as Wyatt dug into his own slice of pie (yes, we made two pies), I noticed a missed call and voicemail on my phone. It was Helen, calling to say how much she and Ed had enjoyed the pie and had eaten the whole thing. Just kidding! They only ate some of it, and "Kelly and Wyatt, you did a great job!" Wyatt grinned, made me play the message three times and asked me to save it so he could listen again. We talked about how it feels when you do something kind for someone and then hear a message like Helen's, and the answer is "REALLY GOOD." I think the kid's heart grew at least one size today. And while our neighborly pie baking and delivery is a very small thing, especially in light of all the big things that need doing in the world, it's something. I can't be the only one who feels like she affects so little. But it doesn't mean I shouldn't try. Perhaps all of our small kindnesses in all of our communities could add up to something big. In the worst case, there will be more kindness. Or more pie. Either way, we win. *Neighbors' names have been changed, because if I fell in the bathtub, I might not be thrilled about someone writing about my mishap on her blog. "Can you believe that your baby girl is nearly eleven weeks old? Congratulations! Enclosed are Goodfood Chocolate Ginger Date cookies to help celebrate." I like to think I'm a good friend, but if I'm honest, I'm a lot more unreliable and inconsistent than I was before I became a parent. Fortunately, people seem understanding about these shortcomings (or at least they pretend to be). But the fact remains that I see a lot fewer people a lot less often than I used to, and getting together with dear friends seems unbelievably and unacceptably challenging most of the time. With one good and very likable post, however, social media can help soothe that "I never see anyone!" feeling and give me the impression that I'm maintaining many relationships. It's a good illusion. And even though I know that status updates and photos of my dinner are no substitute for actual communication with people I care about, I will probably continue to rely on the shortcuts that social media offers because they are so easy and fun. But what about people who aren't on social media? Two of my best friends aren't. Until they had a baby three months ago, I was terrible about keeping up with them because, as I mentioned, they don't exist on social media (and I have become a less-attentive friend). But sometime over the last 15 years of our friendship, these people became family, and I was so overjoyed when they texted to say their baby had been born. I was also frustrated that most of the length of California separates me from them. I couldn't just show up and bring them food on a whim. And I found myself wondering when I'd see the next photo of that adorable baby. Obviously, these two issues aren't problems. Lucky for me, I pretty quickly snapped out of that way of thinking and recognized these "problems" as opportunities to become a better friend. By making a giant pest of myself by text and email, I get almost all the photos and funny baby anecdotes I could wish for. And by sending care packages, I have managed to supply my friends with snacks over many weeks. When I started sending packages, I had no plan for how long I would continue. I just needed to send them love. And snacks. After all, sometimes snacks are love. For the first package, I baked and sent granola bars that would arrive for the baby's second week birthday. The text I received from my friend when the box arrived was all the encouragement I needed to send another package: "Thank you so much for the granola bars! I just ate 2. Our biggest miscalculation has been how difficult it is to feed us. These literally came in the nick of time...."
Over the next couple of months, I kept sending one package per week. Some snacks were healthier than others. I chose what to send based on what I felt like baking, what we had in the house (like zucchini, or the ingredients for granola), and what I thought my friends would enjoy. I baked all of the recipes gluten-free, because that's how we bake at our house. I can hardly express the expansive joy I've gotten from baking (and waiting in line so I can send the boxes)--activities I normally tolerate or even loathe. I'm not quitting social media anytime soon, but all this real life making, sending and connecting has been a refreshing reminder of what friendship can be. Here are the snacks I sent, including links and my personal recipe notes or substitutions. Smitten Kitchen Thick, Chewy Granola Bars -- I use hemp seeds, chocolate chips, dried cherries, and pumpkin seeds. These bars are even better with coconut oil substituted for the butter. I skip the corn syrup and add a bit more maple syrup or honey instead. Elana's Pantry Blueberry Mini-Muffins -- I use 2 tablespoons of honey instead of 1/4 cup of honey or agave, and 1/4 cup melted butter or coconut oil instead of grapeseed oil. Anytime Cookies -- So good just they way they are. Cacao Nib Cookies -- I add one egg and 2 tablespoons of coconut flour, and I use plain cacao nibs instead of chocolate chips. As Wyatt says, cacao nibs don't taste very yummy on their own, but they are delicious as an ingredient IN something. Chocolate Zucchini Mini-Muffins -- I baked this bread recipe in mini-muffin pans. I use vanilla extract, not vanilla stevia. Everyday Granola -- I use coconut oil instead of vegetable oil. Real Chocolate Chip Cookies -- I use sweet rice flour instead of oat flour, melted butter, and added 2 tablespoons of milk to the batter. I let the batter rest in the fridge for about 45 minutes to give the gluten-free flour an opportunity to hydrate and lose its graininess. Week 11: Goodfood Chocolate Ginger Date Cookies/Biscuits Get out your cooking scale because this recipe is written mostly in grams, and it's fantastic. I substituted an equal amount of my gluten-free flour blend for the all-purpose flour, added 2 tablespoons of milk, and before baking, I let the dough rest for 45 minutes in the refrigerator to give the gluten-free flours an opportunity to hydrate and lose their graininess.